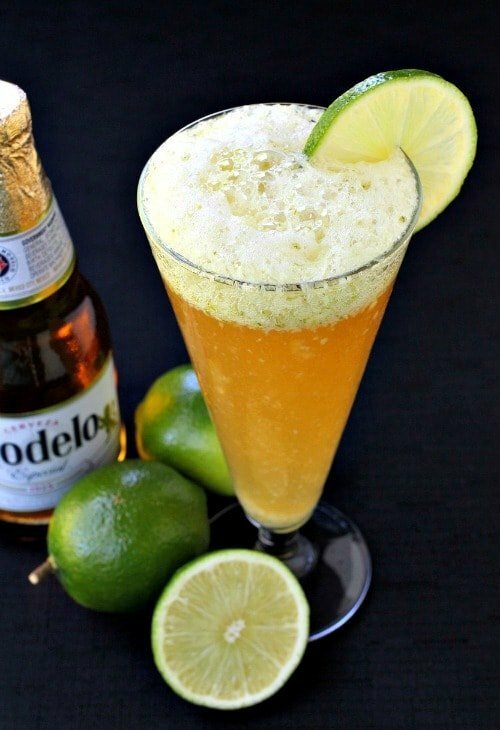 We’re finishing up our Tex-Mex menu with this Limeade Cerveza! 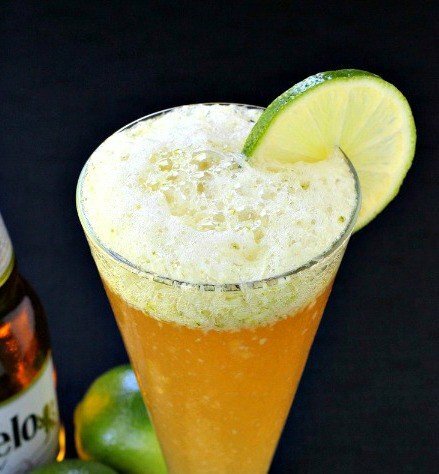 Fresh lime goes perfectly with a light beer, so why not mix them together! This week has been amazing. Low Carb Cheese Crisp Nachos, Frachos, Taco Ravioli, Cowboy Caviar Pizza…and now for the drinks. We took care of the cocktails and Shelly took care of dessert. She made Dulce De Leche Churro Sticks. 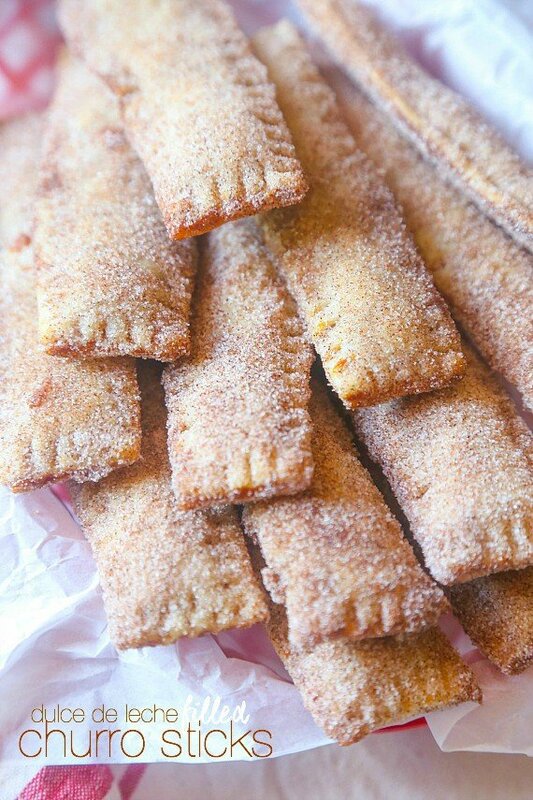 Pie crust covered in cinnamon and sugar, then filled with dulce de leche. I am telling you they are so ridiculously good. The type of dessert that you try and eat up first before the kids come in the room and take the rest. Give them ice cream, you’re going to want to keep these for yourself. 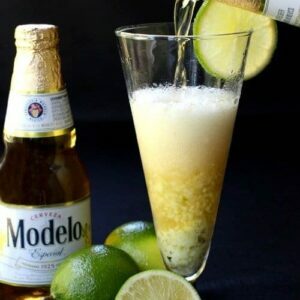 Back to the beer for a minute, we got the idea for this drink from our Lime Drop Shots, making the fresh limeade in the blender with the skin and all. It gives the limeade such a great flavor – we’ve been making all sorts of cocktails using the same method. So grab some of you favorite Mexican cerveza and let’s get started! 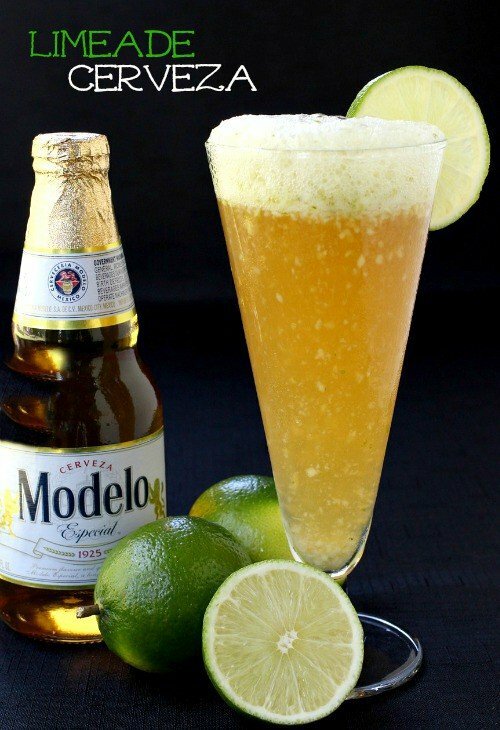 I’ve been trying out some different beer lately (or as usual) and one that I really like so far is Modelo. It’s got a great flavor that can definitely stand up to the tart juice from the the limes – so for this recipe it was the winner. Wash and quarter up your limes and throw them into your blender. Skin, seeds and all. Add about 1/4 cup of water to help it along until it’s smooth. Now you have two choices. You can use the puree as is or strain it, pushing it through a strainer so you just have the juice. It’s like orange juice, some people like the pulp and some don’t -so it’s up to you…but we chose the pulp. 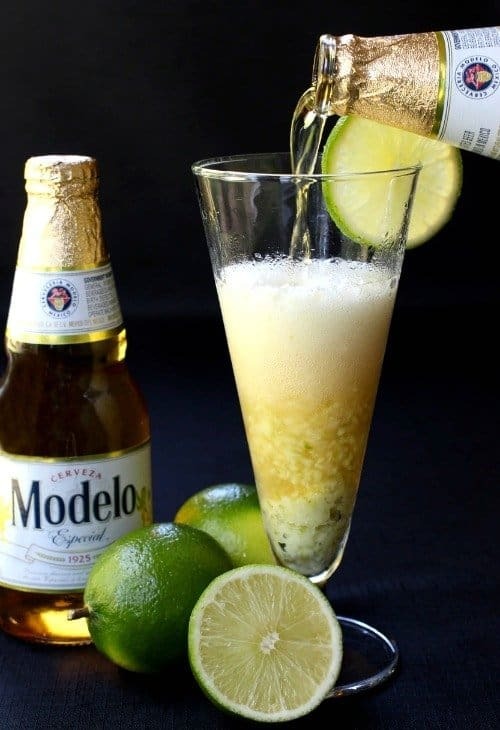 Take a spoonful or two of the limeade puree and add it to the bottom of your beer glass. Top it with your favorite cerveza and drink up. There are 6 of them waiting for you in that pack…unless your making these with your wife and then you only get three. Take the limes and put them in your blender. Add the water and puree until almost smooth. Pour the puree into a bowl and stir in the agave. Add a little more or less depending on your tastes. 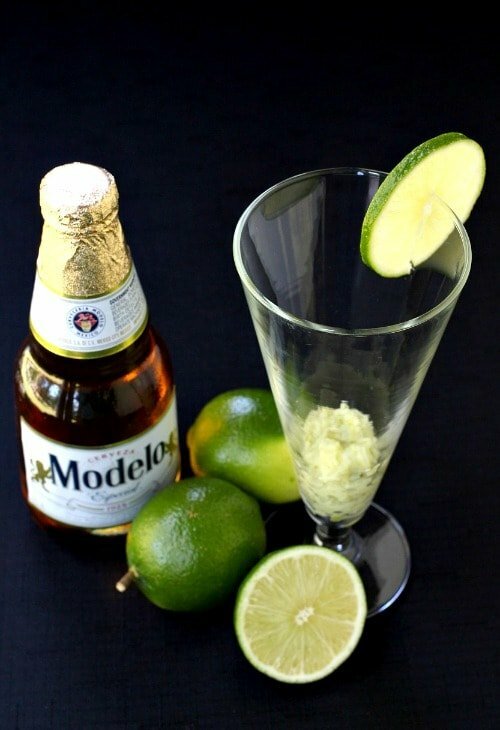 Take a spoonful or two of the lime puree and add it to the bottom of a pilsner. I feel like I need to try this asap! Such a fun week! Very fun week. Wish every week was Tex-Mex week!